The China Daily UK Edition published a signed article by Ambassador Liu Xiaoming Entitled "China, UK can write new chapter together"
Francis Bacon, the 16th Century British statesman, observed that: "Time is the greatest innovator". Two months ago, the United Kingdom voted to leave the European Union, and both Europe and the rest of the world felt the shock. Post­Brexit Britain is now in a time of adjustment - with the coming of a new prime minister, a new government and new policies. The China­UK relationship is also entering an important historical period with new development opportunities. I have had the honor to have been China's Ambassador to the UK for the past six and half years. From this unique vantage point, I have been deeply impressed by the extraordinary progress made in China­UK relations in recent years. This progress was highlighted by President Xi Jinping's successful "Super State Visit" to the UK last year, which greatly advanced bilateral exchanges and cooperation across the board. During that visit, the two countries agreed to build a global comprehensive strategic partnership for the 21st century together. Such a strong relationship and close friendship between China and the UK has extensive popular support in both countries, since it serves the fundamental interests of our two peoples and benefits world peace and development. Both countries have worked hard to come this far and both should cherish what has been achieved. Experience tells us that the important fundamentals for a healthy and stable China­UK relationship have remained unchanged-our two countries need to respect each other, treat each other as equals and attach importance to each other's core interests and major concerns. Next year marks the 45th annversary of the establishment of ambassadorial­level diplomatic relations between China and the UK. As I reflect on what this relationship has gone through and envision its future, I am convinced that a number of steps need to be made in order to maintain the momentum in the relationship and bring more benefits to our peoples. Below is a course of action I believe the two countries should follow. First, we must make continuous efforts to build stronger political mutual trust. Mutual trust is the foundation for cooperation. Progress in China­UK bilateral ties is always powered by mutual understanding, support and friendship between our two peoples. It is natural that our partnership will be accompanied by differences of views, as China and the UK differ in political systems, development stages and cultural traditions. But the old Chinese saying, "truth does not fear contention", embraces the spirit that can be followed to advance relations. Being fair in a dialogue requires the ability to "stand in others' shoes". Candid and in­depth communication and thinking from the perspective of one's interlocutor will help to build trust, expand consensus and clear misgivings. Since the new British government took office in July, China has reiterated its unchanged commitment to growing ties with the UK. The new British government has also stated its position of attaching importance to relations with China. British Prime Minister Theresa May will travel to Hangzhou for the G20 Leaders Summit on Sept 4­5. The summit is an important platform for multilateral cooperation. This year's summit is especially meaningful for China and the UK, since it offers a good opportunity for the British prime minister to have her first face­to­face communication with Chinese leaders. I hope both sides will seize this opportunity to forge stronger trust and closer friend­ ship. This can enable plans for the bilateral institutional dialogues and lay a solid foundation for the long­term growth of China­UK relations. Second, we must stay committed to open and results­based cooperation. In today's world, no country can develop by itself behind closed doors. A zero­sum game leads nowhere, while win­win cooperation is the way forward. 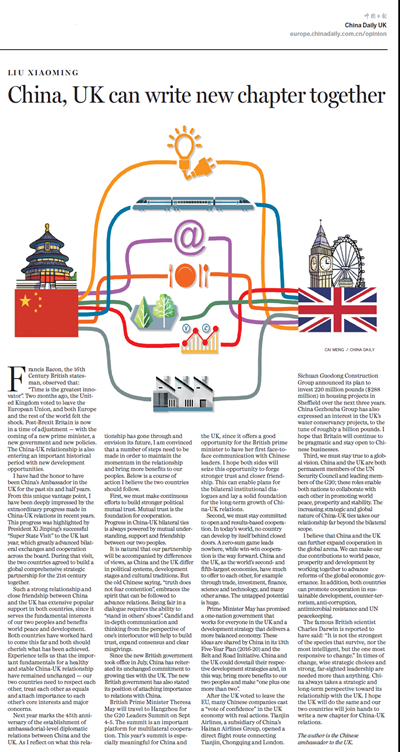 China and the UK, as the world's second and fifth­largest economies, have much to offer to each other, for example through trade, investment, finance, science and technology, and many other areas. The untapped potential is huge. Prime Minister May has promised a one­nation government that works for everyone in the UK and a development strategy that delivers a more balanced economy. These ideas are shared by China in its 13th Five­Year Plan (2016­20) and the Belt and Road Initiative. China and the UK could dovetail their respective development strategies and, in this way, bring more benefits to our two peoples and make "one plus one more than two". After the UK voted to leave the EU, many Chinese companies cast a "vote of confidence" in the UK economy with real actions. Tianjin Airlines, a subsidiary of China's Hainan Airlines Group, opened a direct flight route connecting Tianjin, Chongqing and London. Sichuan Guodong Construction Group announced its plan to invest 220 million pounds ($288 million) in housing projects in Sheffield over the next three years. China Gezhouba Group has also expressed an interest in the UK's water conservancy projects, to the tune of roughly a billion pounds. I hope that Britain will continue to be pragmatic and stay open to Chinese businesses. Third, we must stay true to a global vision. China and the UK are both permanent members of the UN Security Council and leading members of the G20; these roles enable both nations to collaborate with each other in promoting world peace, prosperity and stability. The increasing strategic and global nature of China­UK ties takes our relationship far beyond the bilateral scope. I believe that China and the UK can further expand cooperation in the global arena. We can make our due contributions to world peace, prosperity and development by working together to advance reforms of the global economic governance. In addition, both countries can promote cooperation in sustainable development, counter-terrorism, anti­corruption, antimicrobial resistance and UN peacekeeping. The famous British scientist Charles Darwin is reported to have said: "It is not the strongest of the species that survive, nor the most intelligent, but the one most responsive to change." In times of change, wise strategic choices and strong, far­sighted leadership are needed more than anything. China always takes a strategic and long­term perspective toward its relationship with the UK. I hope the UK will do the same and our two countries will join hands to write a new chapter for China­UK relations. China Daily UK Edition, founded on 1 September 2016, is a daily newspaper issued in the UK from Monday to Friday. It aims to cover stories and off opinions for readers from the government, business and academic institutions, particularly political, business, academic leaders who follow economic, cultural and political developments in China.